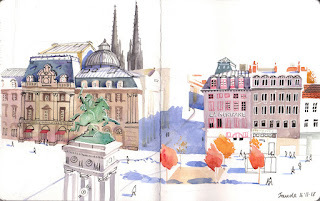 [By Lis Watkins in Clermont-Ferrand] This is the view I had from my hotel room when I was staying in Clermont-Ferrand a couple of weeks ago for the travel sketchbook festival, ‘Rendez-vous du carnet de voyage’. I first visited the event, which is held in the French city, last year and vowed to return, this time with more spending money! Over 90 artists, including many from the Urban Sketchers community, come together to show drawings from their travels all over the world. Quite a few of my favourite artists had stands at the festival and I left with a great haul of books, all signed and some with special drawings too. 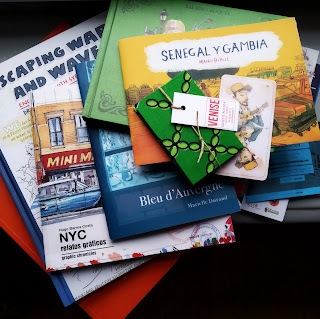 There’s a longer piece on my trip on my blog with links to all the artists from the books in the photo below.